08/20/15 - 1:30 - Syndicated food columnist Linda Gassenheimer, Special wine correspondent Fred Tasker and WLRN hosts Joseph Cooper and Bonnie Berman interview with Penny Parham, Administrative Director for the Department of Food and Nutrition for Miami-Dade County Public Schools. Also in studio, Mary Mulder, Director Food Nutrition Services for Broward County Public Schools. What’s in store for school meals and after school activities -- They discuss exciting new food programs. Crisp crust, warm tasty fillings with melted cheese – no wonder Panini’s have become popular for breakfast, lunch or dinner. Here’s a quick version filled with smoked turkey from the deli, roasted red pepper, fresh basil and goat cheese. There’s almost no prep work. The sandwich can be assembled in minutes. You don’t need a special Panini press to make this sandwich. If you have one that’s great or simply place the sandwich in a saute pan and press it down with a lid. Ciabatta bread is the typical bread used for a Panini. It’s Italian bread shaped like a slipper and takes its name from ciabatta, the Italian word for slipper. It’s long, wide and a little flat and perfect for sandwiches. 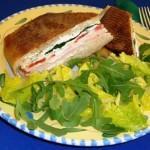 You can use a large baguette, Italian sub roll or focaccia. Cut bread into 2 5-inch pieces and slice them open lengthwise. Spread olive oil on the top half and sprinkle garlic over the oil. Place turkey on the bottom half. Place roasted red pepper over the turkey. Sprinkle goat cheese over the red pepper and top with 5 or 6 basil leaves. Cover with the top half. Heat a nonstick skillet, large enough to hold both Paninis, over medium-low heat and spray with olive oil spray. Add the Paninis and press down with a lid. Saute 3 minutes. Turn over and press with a lid. Saute another 3 minutes. Makes 2 servings. Place Italian-style salad in a bowl. Tear arugula into small pieces and add to bowl. Toss with dressing. Makes 2 servings. Staples: Olive oil, garlic, olive oil spray and reduced-fat salad dressing. Shredded sharp Cheddar cheese, Monterey jack cheese or a stronger cheese such as gorgonzola can be used instead of goat cheese. Sliced ham or chicken can be used instead of turkey. Saute the Paninis over medium-low heat so the insides will warm and the crust will be crisp and golden brown, not black. Assemble Panini and start to cook. While sandwich cooks, assemble salad.